A busy time at West Wilts with lots of lovely young horses. ESCAPE ROUTE and VIVENDI DE VARDAG were both competing in the 5yo class. Viva performed what was absolutely her best test to date to score a very competitive 30.5. 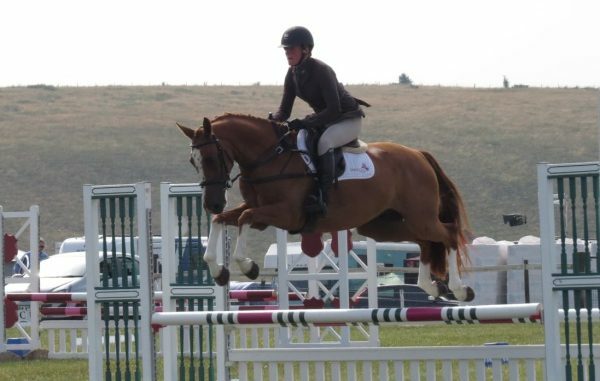 She then jumped a beautiful double clear inside the time to finish in 6th place. Escape Route was lovely on the flat so we were very disappointed with his mark of 33, we felt he had done a very good test indeed! He too jumped an absolutely lovely double clear, however he is now finding these tracks so easy I managed to pick up 2 time faults for going 2 fast! He cruises so well, and has such an incredible gallop I didn’t feel fast at all, hopefully something that will be a real strength in seasons to come. THE DIAMOND GAMBLER scored 33 in the dressage and jumped another double clear inside the time to finish 10th – good boy Brian, such a consistent boy! CLASS SPEC was in the 4yo class, he was very sweet on the flat to score 30, his work is improving all the time and given time and strength should pick up some very special marks. He jumped a lovely round SJ just breathing on the last fence which was very annoying but he then took matters into his own hands XC and decided he knew much better and picked up 2 cheeky run outs! I’m delighted he’s so happy and confident but a few lessons needed before his next event just to confirm which one of us is in charge! !